To mark the bicentennial of Meriwether Lewis and William Clark's famed journey west, my husband and I visited Fort Clatsop outside Astoria, Oregon to see where the Corps of Discovery spent the winter of 1805-06. Fort Clatsop is part of the new Lewis and Clark National Historic Park, spread out over a dozen sites in Washington and Oregon. The site includes an authentic replica of the fort, just 50 feet square. We sat in replicas of the Corps of Discovery's dugout canoes–none too large or comfortable! We also had fun participating in a fire-starting demonstration, one of several programs led by costumed rangers during summer. Astoria is where U.S. Highways 30 and 26/101 meet in far northwestern Oregon. 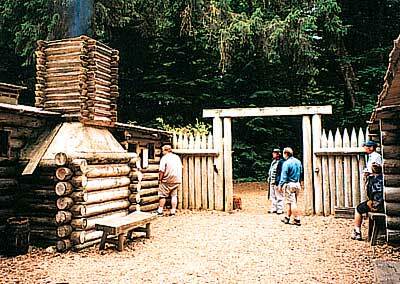 Fort Clatsop (92343 Fort Clatsop Rd.) is about 6 miles southwest of town and roughly 3 miles southeast of Business U.S. Highway 101. In fall, winter and spring, the site is open from 9 a.m. to 5 p.m. daily. The park is open an hour later from mid-June through Labor Day, with daily admission including a 3 day use of shuttle bus service to other historic sites — costs. To learn more, call 1-503-861-2471.